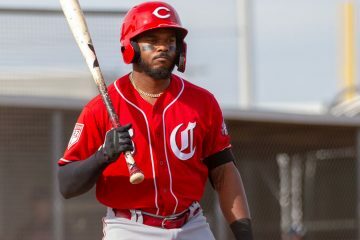 The Cincinnati Reds have called up outfielder Phillip Ervin from Triple-A Louisville. He will be taking the place on the 25-man roster of outfielder Scott Schebler. He was placed on the disabled list with a shoulder injury after running into the wall before the All-Star break. 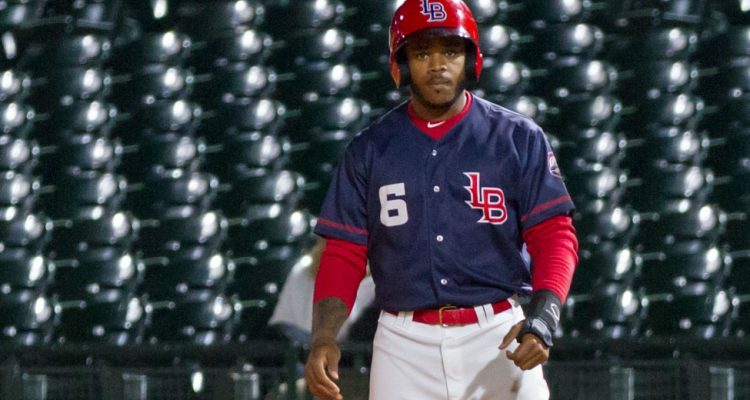 Phillip Ervin has been on an absolute tear over the last month for the Louisville Bats. In 100 plate appearances the outfielder has hit .384/.450/.663 with five doubles, two triples, and five home runs. He has also walked 10 times with 17 strikeouts in that stretch. The Reds are in an interesting situation right now. Billy Hamilton has been hitting the best he’s hit all year over the last few weeks. The Reds realistically should be trying to trade Billy Hamilton right now, but we’ve heard rumors all year that Bob Castellini would prefer that the team keeps him. If the team is being told to keep him, then the Reds need to plug Phillip Ervin and his hot bat into center field multiple times over the next week and see what happens. If the team is given the ok to trade Hamilton in the right deal, then that complicates things as you want to keep him on the field and showcasing him a little bit. Billy Hamilton isn’t the future in center field for the organization. That likely falls to either Taylor Trammell or Jose Siri. Both of those guys are still a little bit away from the Major Leagues, though. And to be fair, it’s certainly possible that Phillip Ervin should be in the conversation, too. He’s had some offensive struggles – mostly struggling to hit for average over the years. What Ervin has done, though, is draw walks, limit his strikeouts, and run the bases very well. This season, at least in the minors, he’s been able to hit for a good average. And that’s led to a very high on-base percentage and a good slugging percentage. The last thing the Reds should do is call Phillip Ervin up and not play him, or use him as a pinch hitter twice in a week and then send him down to Triple-A when Scott Schebler returns. They should use this time to play him in center field multiple games, let him get somewhat comfortable out there, and see what happens. Teams scouting Billy Hamilton have been scouting Billy Hamilton for his entire career. They aren’t going to get some new, unknown information on him between now and the next 11 days. He is what he is and everyone knows that. If they wanted to acquire him on Monday, they’ll still want to on July 29th. I wouldn’t outright bench Billy Hamilton. I’d mix him in. But what I wouldn’t do is just start Billy Hamilton every single day in center and keep Ervin in the corner once a week to sit Adam Duvall for a rest, or Jesse Winker against a tough lefty. You do not bump hamilton for ervin…..you don’t trade hamilton until somebody knocks you over, which they won’t do right now. or until one of those two guys you mention is ready for the big leagues. Does it really take much to bowl youbover to replace 230:.315/.318/.628. Some fans act like he’s a super star and I don’t get it. Nobody will never knock the reds over for Hamilton. Package him with homer and you might get a donkey of tambourine. Like to see what ervin can do at the MLB level. He may also be a trade chip for a starter. Not sure what is going on this time of year. He’s got good gap power. Homerun power. He and Dilson. Most reds fans always want to trade those that can help the most. The only problem with this article is you never actually say why the reds shouldn’t call up Ervin, use him as a bench player, and then send him down after Schebler returns. What’s the problem with that? I really like Ervin but I see no problem letting him continue to prove he can hit for average this year in AAA. Billy Hamilton is finally hitting and the team is playing well together and now its time to suddenly sit Billy down in favor of Ervin because they might trade Billy? If neither player is the future, then why is Ervin suddenly so important? With this logic, Brandon Dixon should be playing every day and Scooter should sit because the reds might trade Scooter and the league already knows what Scooter can do. Well, for starters, the Reds DID call up Ervin. So I’m not going to write about why they shouldn’t. And I have no problem with sending Ervin back down when Schebler returns if the team isn’t going to play him. But if he’s going to be up here, he needs to not rot on the bench. Also, read the entire article because I absolutely stated within that maybe Ervin IS the answer in center field. This isn’t remotely comparable to sitting Scooter for Dixon, so please, stop with that silliness. Ervin has a career 237 average in 5 1/2 seasons in the minors and he doesn’t even play CF much in the minors anymore (8 games this year). So why shouldn’t he sit on the bench? Because there’s a chance that he is actually the best option to play in center field? I don’t care what his career average is. I care about what he’s capable of doing today. As I said in another comment here – maybe the Reds don’t think he can play center adequately enough, and if that’s the case then all that I’m saying is moot in regards to center. 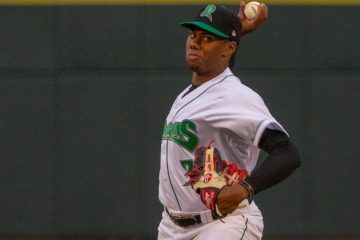 But, my premise is that right now the Reds would be served well to see what he can do out there and utilize the stuff that you can get in the Major Leagues in terms of defensive metrics that you can’t get in the minors (the minors almost all have trackman – but not the defensive tracking systems that the Majors have) in order to give them a more finite idea as to whether he can or can’t. But, I’ll also say that when Billy Hamilton and Adam Duvall are 2/3 of the outfield, you don’t bring up a guy as hot as Phillip Ervin to sit every day. Maybe you don’t play him every day (which I clearly stated in the article), but you need to mix him in there and get him playing time. 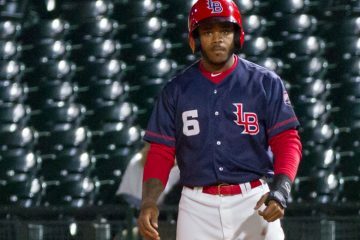 If the reds seriously thought Ervin was the answer at CF, he would actually be playing CF in Louisville. Saying he might be the future at CF doesn’t make much sense. I’d tend to agree. But if this team is willing to play Scott Schebler in center field every so often, then to me there’s zero reason this team shouldn’t be willing to play Phillip Ervin in center field every so often. I agree that trades of Billy Hamilton should be explored. But a trade like that could certainly happen in the offseason rather than at the upcoming trade deadline. So I see no reason to sit Billy during his own recent hot streak (311 AVG in July). Billy isn’t a great hitter but a good second half at the plate would do nothing but help his trade value this offseason if he is still around then. At this point, Ervin has no trade value compared to Billy so if you really want to get the most of Billy let him play at least while he continues his decent hitting of late. Billy’s hot streak is only a hot streak because Billy can’t hit. If Eugenio Suarez had “Billy’s hot streak” it would be considered a slump. In fairness to Billy a little over a year and a half ago, a 311 was a hott streak for Suarez as well as Scooter. Not saying Billy figured it out just you never know weird things happen. .311 is useless without the other numbers. Billy Hamilton’s “hot streak” is an .817 OPS. That’s not a hot streak for Suarez. Or Scooter. Not today. Not last year. Not two years ago. HAHA good point Doug. I was just saying some guys figure it out later than others was my point. Doug it looks like you have brought out the Hamilton lovers. Mostly emotional crap. If you think Erv is going to get regular time over the remaining outfielders you haven’t been paying attention. If that’s what you took from this article….. It is not. I agree with you completely, but this team rarely uses their imagination when it comes to getting bench guys at bats. Especially when they are young. Phillip Ervin and Dilson Herrera on the same bench will be interesting. Give them some playing time the next week and a half to audition for more playing time or for a trade at the deadline. Both could be part of next year’s team, and both could be in a package for a starter. Or, Ervin could free up Duvall for a trade. Duvall-Herrera-RStephenson to LA Angels of Anaheim for a LHP, either Andrew Heaney or Tyler Skaggs. I think Heaney would be a better fit on the Reds and in the NLC. 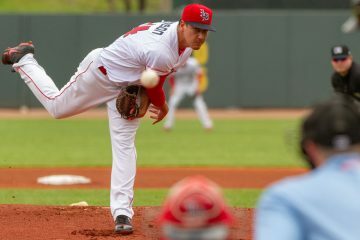 3 ML players for the Angels with considerable team control and at positions of need and a much needed LHP with a good sinker for the Reds rotation. And Heaney takes the place that will be vacated by Matt Harvey when his trade comes. Trading Stephenson will allow Bailey to have his spot back in the rotation without any controversy. And trading Stephenson and Herrera with no options left the Reds will have ridden themselves of any drama or controversy in that regard for this winter or next year. Billy Hamilton needs traded just to remove the cost of this half year and next year off the books. We have more important areas of the team to address and Billy doesn’t provide that value to this team in this ballpark. You have to already have a playoff team to have the worlds best pinch runner, base stealer and center fielder that’s a light hitter. Hamilton’s value is what it is right now, as Doug mentioned. He’s been on a little roll which can’t hurt. If anything him getting hurt is about the only way his value changes. So playing less is arguably better. IMO Hamilton is a throw in on another trade for Iglesias, Harvey or Gennett. Possibly Reds pay his salary this year to increase the prospect return. The big thing not addressed is that Phil Ervin is on fire. If he got regular playing time and was able to prove he belongs in the majors with very solid numbers… not only does that temporarily fix the CF problem and make the team better, Ervin could become worth a ton. Suarez wasn’t worth much and now he’s likely the most valuable player on the Reds (also due to contract). Ervin’s numbers in AAA suggests he’s got a chance to be the real deal. You could trade him now but the uncertainty on translating to the majors would limit that value. Putting up those numbers at the majors and then he’s worth a ton because he’s got full control left. It then gives you the chip you need to trade for a starting pitcher or the solution in CF with Trammell in right field since Winker has to play left IMO. Long story short, let’s see if Ervin with regular playing time for the second half can keep it going. If so, they’ve got a trade chip worth many times more than Hamilton. Let the young players play, including Garrett starting, Stephenson starting and let’s see what they can do and if they can prove themselves for next year. R. Stephenson’s numbers in AAA are insanely good for a K/9 rate. Walks are also down. It’s a bummer Cody Reed hurt his shoulder as he was also getting on track. Hopefully nothing serious and no impact to his performance. Glad Ervin got the call but not to sit like Herrera though. Ervin could be a Late Bloomer do not wanna stop his progress with his newer swing stance. I feel pretty confident that Ervin, given the same shot Peraza has been given, would eventually OPS .750 in CF. He has potential to put together a season around .850 OPS in his prime as well. I also think he’d be just okay on defense. I’d love it if he were the bridge to Siri / Trammell in 2022 starting this August. I think the defense is what keeps Ervin from getting the chance. I’m not sure I agree with it or not, though. I do know this much, though: I’d have given it a shot by now. Maybe the Reds just don’t think he can do it adequately enough. I really don’t know, but the lack of consistent playing time in center in the minors suggests they don’t think he can. Which is weird, because he’s certainly fast enough. And if you don’t think the instincts are there, they aren’t going to improve by not playing him there. So it’s a strange one to me a little bit. He certainly passed the eye test when he played some center in Dayton.Dont know why they stopped his playing time there. One thing I notice now is his first step in center seems tentative. I don’t notice it when he plays corners. But anyone who has seen Ervin in person has to admire his athletic abilities and baseball instincts. If Reds waive him someone may just get a real steal. Tom, I agree. If Ervin was given an opportunity as long as Perraza has been given we might see a pretty good ball player.and like Perraza with extended play his defense would only get better. And I don’t think it is as questionable as Perraza`s who has really improved defensively .Ervins only real knock has been batting avg. and as Doug pointed out it would be great to give him some decent time while he’s on all cylinders instead of sitting him and losing all that momentum. Wichita might crush his confidence. I think he’s earned a little more playing time. but I doubt he gets it. Just an off day according to Riggleman. Votto’s older, played in the game. Just giving him an extra day off. Ervin gets to start first game. Also appears they could be utilizing a 6-man rotation as Rigg said Bailey goes Tuesday and Romano will pitch Wednesday if not needed in the bullpen before then. Interesting, although I bet Romano will be needed for long relief on Tuesday. After reading the Athletic article by Mo Egger, I believe the Red’s need to go back to tanking it! Okay, I have enjoyed this last two months as much as the next guy and it is really cool to see the possibilities. However, they still need to add some pieces and decide WHO is the future and who isn’t. Playing to get as close to .500 as possible has some benefit as far as creating a better culture and maybe some buzz that sells more tickets. However, I believe they can help next season and beyond by being more liberal with playing time. Also, let Bailey, Finnegan and others pitch and this way you might see what’s left and lose without trying to lose. What’s with the site and mobile devices? It’s moving as I try to read. Is this just me? What device are you using? Do it do this on every single page/article you read on the site or a specific one?